Mix onions in oil and cook until tender, stirring 10 – 15 minutes. Add rice, tomatoes, salt and 1/2 cup purified water, cover and cook 5 minutes. Remove from stove. Add remaining ingredients and mix well. Allow to cool. 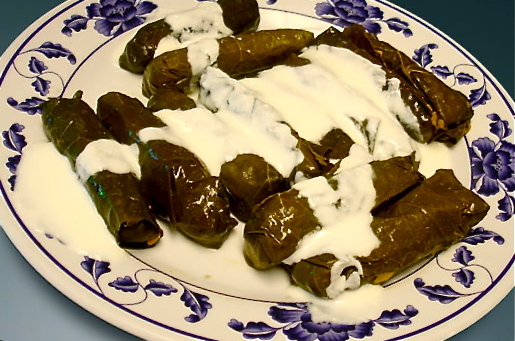 Take rinsed grape leaves with stems removed. Spread a leaf on plate, wrong side up, with stem towards you. Put a teaspoonful of filling near stem end, fold over sides, then start rolling from the stem. Place leaves on bottom of pan and arrange rolled leaves side by side in the pan in 2 – 3 layers. Place a plate over the top, add 1 1/2 cups purified water, just covering them. Cover and cook on low heat for 1 hour. Leave in pan until thoroughly cooled to prevent discoloring. Arrange on platter. Sprinkle with juice of 1/2 lemon, if desired which will prevent them from looking black and will retain their color. Drizzle with olive oil to make them shine. Chill. Best if served cold. Garnish with lemon slices and Green yogurt which is optional. If you are vegetarian or vegan omit the yogurt and use the fresh squeezed lemon slices.